You can reach Graz Art Museum ("Kunsthaus Graz"), Mur Island ("Murinsel"), Main Square ("Hauptplatz") with the main shopping street and the Congress Center Graz by foot. In addition, there are punctual transport connections (tram stop right outside the hotel). You are more than welcome to start your day with breakfast at our buffet or end your evening relaxing in a bar nearby the hotel. Additionally, free daily newspapers are at your disposal at all time. If you want to get to know the Graz and its environment differently, bikes are available for rent at the hotel. It is ideal for business and leisure travellers who are looking for a new modern city hotel located in the City-Center of Graz. Graz has a long history which started 900 years ago when Graz experienced the first heyday in the Renaissance as glamorous residence of the Habsburgs. As a legacy of the period Graz has one of the best preserved old towns in Central Europe – which is why Graz was declared a "World Heritage Site". High quality of life, vital economy, education and culture make the Styrian capital the hotspot of south Austria. In 2003 Graz was the only "European Capital of Culture" and since 2011 Graz is "City of Design" and part of "International Network". 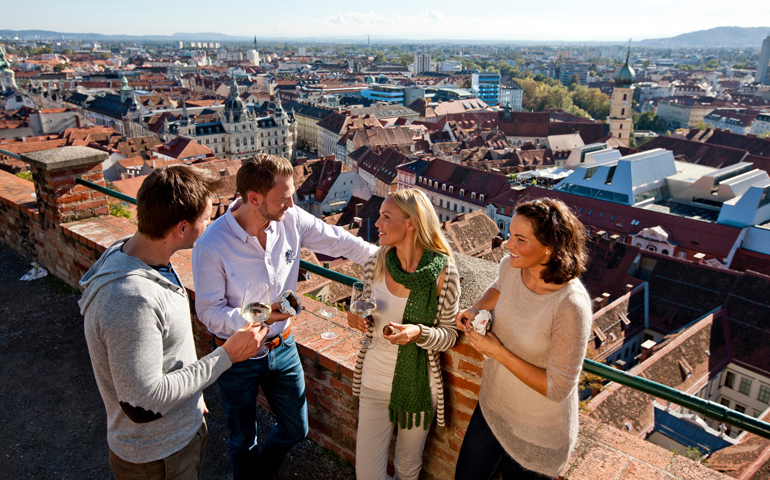 Graz is a city lifestyle and connoisseurs. With the southern way of life, the mild climate and the products of the Styrian culinary region all the senses are stimulated. International brands but also antique shops, galleries and workshops with the finest craftsmanship invite you to shop.